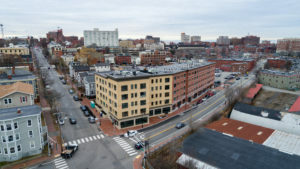 This view from York and High streets shows the proposed mixed-use development that includes 63 market-rate apartments. Developers are hoping to break ground on two projects within the next year that would add more than 200 units of housing and bring more than $36 million of new construction to Maine’s largest city. Together, the projects, which were approved unanimously Tuesday by the Planning Board, will help address a shortage of housing for both young professionals who want to live downtown, and seniors. “Both of these projects are creating good diversity of housing in Portland,” said Stuart “Tuck” O’Brien, the city’s planning director. Portland has seen a resurgence of residential development. More than 100 market rate units – both condominiums and apartments – have been built in the city over the past two years. 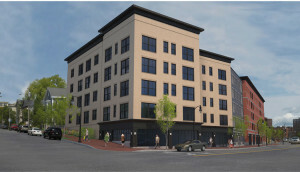 Hundreds of others have been permitted but not yet built, including the 440-unit “midtown” project in Bayside and a 139-unit apartment building at 665 Congress St.
On Tuesday, J.B. Brown & Sons received conditional approval for a large mixed-use development at York and High streets that will include 63 market rate apartments and a two-level parking garage. The Portland based-developer will have to return to the Planning Board, however, after addressing a few minor design issues flagged by the board, including members’ desire to have raised flower planters installed along High Street. At about $2 a square foot, projected rents range from $1,500 to $3,000, Veroneau said. The project, which would take about a year to build, would require the demolition of the former El Rayo Taqueria and El Rayo Cantina restaurants. Plans show a complete build-out of the nearly 1.7-acre lot, which has 300 feet of frontage on York Street, but the building is designed to look like three separate structures. The building closest to the intersection of York and High streets would be tan with black storefronts, and next to it would be a gray building. The largest of the three, with frontage on York Street and closest to the Old Port, would be made of brick. Also on Tuesday, Hawthorn Retirement Group received approval to build a 150-unit independent senior housing complex at 802-828 Ocean Ave.
Larry Wright, Hawthorn’s director or marketing, said the family-owned development company based in Vancouver, Washington, plans to begin construction in May and finish in 2017. Plans include 57 efficiency units, 78 single-bedroom and 15 two-bedroom units. Wright said rents are currently projected to range from $1,995 to $4,100 a month, though he noted that construction costs are increasing. He said the rents are all-inclusive, covering three daily meals served in a restaurant-style dining room, a live-in management team, weekly housekeeping services and regular maintenance. O’Brien, the city planner, said the projects represent the type of density the city needs.